Bluebird Twisties are a puffed corn snack, packed full of cheesey flavour. This 120g bag can cure the biggest craving for a snack. 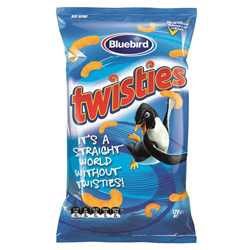 Bluebird are proudly kiwi and proud of their Twisties. Corn, Sunflower Oil, Whey Powder (Milk), Tapioca Starch, Salt, Flavour Enhancer (E621), Cheese Powder (Milk), Hydrolysed Vegetable Protein (Soy), Mineral Salt (Potassium Chloride), Sugar, Rice Bran, Emulsifier (E471), Yeast Extract, Colour (E160E), Food Acids (Lactic Acid, Calcium Lactate, Citric Acid, Ascorbid Acid), Flavours. like wotsits on steriods. my english daughter loves theses and gets very excited when she sees them in the cupboard! twisties is one of my favourite treats especially the bluebird nz twisties they are awsome and yummy nothing is like it, soooh cheessie and puffy crunchies, i love the kiwi twisties. ummm !! !